Why Do Research at the Library? 1. Librarians. They are trained professionals, who know how to find what you are looking for, whether in the stacks or online. 2. Non-searchable print. There are millions of books and other print materials that have not made it to the web. 3. Reliability of information. Not all of the information you find on the Internet is accurate. Anyone can "publish" online, and it is not always easy to distinguish between reliable and unreliable websites. 4. Finding anything that is not historical or current. The Internet is a great resource for information that is either very old, or very new. The library has most everything in between. 5. Price. The use of a library, including all of its electronic services, is free. Some of the research resources on the Internet are not. Libraries often pay steep prices and provide full access to these resources. • Inability to recognize or understand a problem. When stressed, it is difficult to access stored information quickly (if at all). Short-term memory is affected. You may incorrectly identify something as a problem when in fact it is not. • Difficulty brainstorming and setting reasonable goals. When you do not accurately recognize the problem and you have trouble concentrating, you may come up with a quick or irrational solution. You tend to think only about the immediate future, so planning is difficult and decisions are often made quickly. • Inability to assess the solution. If you are having trouble taking in information, you will not be able to see if your solution works. A short-term view of everything may keep you from being concerned with the implications of your solution. advertising, where the marketer aims to manipulate your spending habits by making you want to buy his or her product or service. 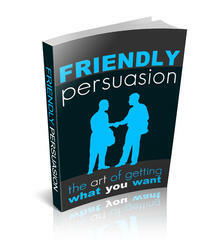 When you understand how persuasion works you can avoid being swayed by it and use it to your advantage.